Howard Area Community Center (HACC) is pleased to announce that its Board of Directors has selected Amy Skalinder to become the next Executive Director of the community-based social impact agency. 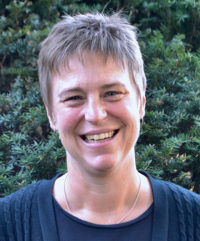 Amy’s career has largely been in the nonprofit sector with organizations that focus on serving youth and families and community health, including ten years in various roles at the McGaw YMCA in Evanston and six years as the Executive Director of Angles (formerly LINKS – North Shore Youth Health Service) in Northfield. She joins HACC from NorthShore University HealthSystem, where she provided operational leadership to large outpatient psychiatric and behavioral health practices across multiple sites. As Executive Director of Angles for Sexual Health, Identity, & Education, Amy enhanced the organization’s fundraising efforts and updated infrastructure for operations that reached over 15,000 teens and young adults each year with reproductive health care, health education, and LGBTQ youth programs. Through her leadership roles at the McGaw YMCA in Evanston, Amy was a driving force in various operational improvements, including restructuring membership fees to increase access and membership, and redesigning procedures to vastly improve customer service experiences for all visitors. Evangeline Semark, HACC Board President, led the search committee that selected HACC’s executive director, comprised of Board members Torrence Gardner, Marissa Graciosa, Alicia Hart, Isaac Jones, Ron Kramer, and Ann Serb, in partnership with the agency’s Head Start Policy Council Chairs Akbar Briscoe and Kortne Potter. Amy is a graduate of Evanston Township High School, Tufts University, and Loyola University Chicago where she earned a Master’s Degree in Social Work. Outside of work, Amy enjoys spending time with family, singing in a classical chamber choir, and playing ice hockey. Amy’s first day as Executive Director is September 17, at which time Stephania Koliarakis, who has been serving as the Interim Executive Director since June 2018, will resume her role as HACC’s Director of Early Childhood. Amy succeeds Bruce Rasey, who held the Executive Director position at Howard Area since 2010 before retiring on May 31, 2018. In the months to come, HACC will be hosting an event to welcome Amy and celebrate the efforts of all Howard Area staff who worked tremendously hard to fulfill HACC’s mission and manage the agency through the time of leadership transition. Please contact Patrick Price, Director of Development via e-mail at pprice@howardarea.org to be notified when an exact date is set.